Keep food safely at or below FOODSAFE guidelines of 40 degrees F for up to 8 hours without the use of unsanitary ice baths or electricity with the CM1105C1402 Cold master 1/6th size CoolCheck insulated food fan from Carlisle. Cold master CoolCheck food pans are insulated with a non-toxic refrigerant gel that can be recharged by freezing overnight. Once frozen, the patent-pending color-changing technology allows workers to see when food temperatures are safe eliminating waste and uncertainty when it comes to food safety. Cold master CoolCheck food pans fit into standard size food pan templates. The CM1105C1402 is a one sixth size for maximum flexibility. The 1.7 quart pan measures 6.88 x 6.25 x 6.38 inches (L x W x H). 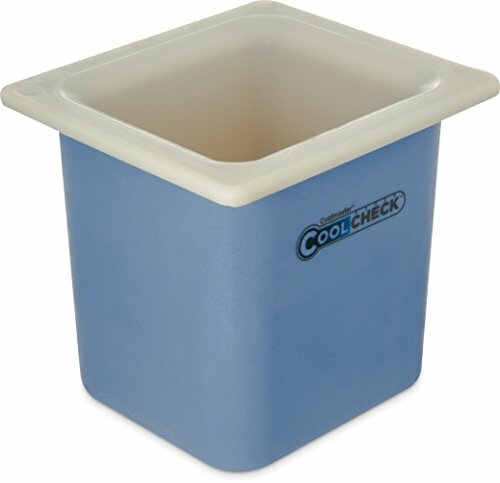 Cold master CoolChecks are ideal for use in front-of-house operations for buffet service areas, food bars, coffee stations or condiment bars and back-of-house food preparation and storage areas. The Cold master CoolCheck is blue / white in color. CoolCheck insulated food pans are dishwasher safe for easy cleaning. They are approved by the National Sanitation Foundation and the FDA.